This book shows how to understand what application you want to write, what strategies are likely to get you there, and then how to measure your level of success. This book offers practical, concrete advice about how to stay in tune with your project and ensure that your products are at least as good as your plans. - Phil Goodwin, Staff Engineer at Sun Microsystems. Produce scalable, reliable, high-performance Web-enabled applications in Java. Web infrastructure is everywhere. 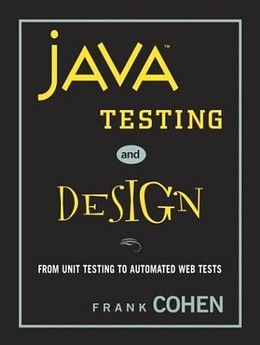 And yet until this book there was no guide to show how your choices in design, coding, and testing impact the scalability, performance, and functionality of your Web-enabled applications. Author Frank Cohen shares proven best practices based on his extensive experience at leading enterprises (General Motors, BEA, AMP, 2Wire, Elsevier, U.S. Navy, Sun) and delivers an immediately useful set of open-source tools, techniques, and code that will automate the testing of your Web-enabled applications. Secure Internet services using current and next-generation technologies and much more! Bart Thompson walks you through some of the key topics covered in Java Testing and Design. "This book is an excellent guide to testing Web applications and Web services. I expect it will benefit all readers, from software developers or QA techs just getting started, through to the experienced coders and testers. The book took me past the basic stuff you learn in books on Java development and gives you the practical experience, tips and knowledge I needed to deliver software that scales and is reliable."